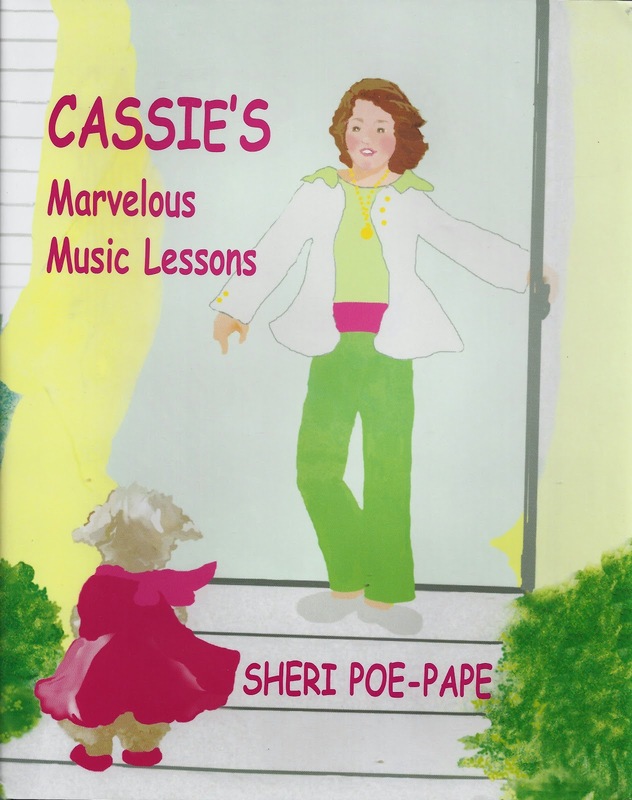 Cassie’s Marvelous Music Lessons is the first book by Sheri Poe-Pape. When not writing Sheri is the director of Pape Conservatory of Music where she has spent the last thirty three years teaching piano. Cassie’s Marvelous Music Lessons is based on fourteen years of sharing her teaching with her beloved canine companion. Within Cassie’s Marvelous Music Lessons Sheri Poe-Pape introduces us to a sweet little dog Cassie and her owner Mrs Applebaum. The personification of Cassie ‘the marvelous music mutt’, whilst still maintaining her dog qualities, had me wondering if it was going to work but Sheri has pulled it off nicely, producing a character that delighted my 7 year old daughter. Cassie’s Marvelous Music Lessons speaks of love and warmth. Cassie is an instant hit with the children who attend the piano lesson of Mrs Applebaum, providing an atmosphere that promotes learning and understanding. For Mrs Applebaum having Cassie in her life opens her heart and helps her tune into her skills of listening and understanding. Cassie has something to say to Mrs Applebaum but she does not seem to understand. With a lot of perseverance from Cassie and a little bit of patience from Mrs Applebaum the message is soon loud and clear and Cassie is rewarded. As far as illustrated children’s books go Cassie’s Marvelous Music Lessons is a little more wordy than the norm. This makes it more suitable for the older reader or as a read to me book for the younger child. I feel the illustrations within Cassie’s Marvelous Music Lessons are very basic, not quiet giving me what I would have liked. With the length and depth of the book I would have liked to have seen illustrations that are more inviting and have a more 3D effect, matching the personification and bouncy flamboyant feel of Cassie. In this instance the match of author to illustrator was done by the publishers Mayhaven Publishing, being a reflection on their choice not that of the author. This reflection should not take part in the consideration of purchase as Cassie’s Marvelous Music Lessons has a great story to tell. Overall Cassie’s Marvelous Music Lessons is a fun loving read with positive messages. Speaking of the universal language of music and the companionship provided by a canine friend, Cassie’s Marvelous Music Lesson has the ingredients of a book that will be loved by children. It is presented as a hardcover high quality book that sits nicely on a child’s book shelf, lasting for years. I look forward to following the growth of Sheri Poe-Pape as an author. I wonder if we will see further adventures by Cassie the marvelous music mutt. Purchase a copy of Cassie’s Marvelous Music Lessons from the author’s site, Amazon and Barnes and Noble.